You’ve probably seen the commercials asking, “Want to look younger? Erase years from your face?” And of course they’re using beautiful, air-brushed models to promote a product that claims to eliminate wrinkles, age spots, and other flaws from mature faces. Well, there may actually be something to those products. Serums, creams, and toners made with Vitamin C have been flooding the beauty market lately, claiming to take years off your face. But there are problems with the store-bought versions of Vitamin C skincare products that can be corrected by making your own at home. Today we share a very simple DIY project that actually works and can save you tons of money! Vitamin C, also known as ascorbic acid, is said to have many anti-aging benefits for skin. It’s a potent anti-oxidant, is anti-inflammatory, and is very soothing for the skin. What does all this mean? Put simply, Vitamin C can improve skin elasticity, prevent fine lines by stimulating collagen production, protect skin from damaging sun rays, and have a lightening effect that helps fade age spots or sun spots. Even if you get adequate amounts of Vitamin C in your diet, a topical application of Vitamin C is the best way to benefit your skin (source). This cinical study on the topical application of Vitamin C shows that solutions made with 5% Vitamin C (in the form of ascorbic acid) produced positive results on damaged skin after repeated use. So does this mean that all those commercial products are worth the money? Not exactly. Ascorbic acid is highly unstable and oxidizes within a few days when exposed to air, heat, or light. So don’t waste your money on an expensive product that may become ineffective after only a few days. The good news is, you can make your own product at home by mixing up small batches every few days to maximize the effects of the Vitamin C.
While making your own Vitamin C toner every few days may seem cumbersome, adding this homemade product to your skin care routine may help enhance the tone, texture, and brightness of your skin. And that makes it worth the effort, right? Add ascorbic acid to spice grinder and blend into a powder. (This prevents the finished toner from being gritty.) Combine all ingredients in a small amber or cobalt glass bottle. Cap tightly with spray top and shake well to combine. Store in a cool place and mix a new batch every 2-3 days for best results. Use morning and night on a clean face before applying moisturizers or makeup. Shake vigorously before each use. With eyes and mouth closed, spray generously all over face and neck and allow to dry. You should mix up a new batch of toner every few days for maximum results. Vitamin C oxidizes quickly, so its effectiveness will diminish after a few days. Because Vitamin C oxidizes even faster when exposed to light, it’s also very important this toner be stored in a dark colored glass bottle. Ever used a product containing Vitamin C? If so, what were your results? I used a Vit. C tablet, grind it up really fine (since that was all I had)added it to a very small amount of hot water to melt it. Thank you very much for this recipe. I was just wondering what other oils contain vitamin E and easier to find ? and also, the only vitamin C I have is supplement tablets with 1000mg concentration along with 800mg calcium carbonate.. can I use them ? and if so, how much of them would be enough to work ? The oils Vitamin E is most commonly found in are corn oil and soybean oil. However, I wouldn’t recommend using either of those oils for cooking or in beauty products. They are likely to be made from GMO crops, and you’ll only be getting a small amount of Vitamin E in them. You can actually find Vitamin E oil in most pharmacies/drug stores. If you can’t find it there, I would recommend leaving it out of the recipe. You can certainly go ahead and use your crushed tablets for this toner. Use about double the amount of crushed Vitamin C tablet. I’m not sure about the calcium carbonate tablet though…you’ll have to experiment with it. Just purchase hydrosols and can’t wait to try this!! Thanks for sharing your recipe! Ascorbic acid is still a partially synthetic by-product of naturally occurring Vitamin C. When I ask Dr. Tracy Gibbs, a PhD in Pharmacognosy (the study of medicinal properties of plants), how non-PhD people are suppose to understand whats real and what’s not, he says “have you ever seen an ascorbic acid tree”? There is a product that is the most natural I have ever seen (made from Acerola Cherries and Rose Hips), open the capsule and mix as suggested or mix right into your coconut oil as a natural moisturizer and anti-aging remedy. You’re absolutely correct about ascorbic acid being a partially synthetic by-product. However, the research I’ve found about Vitamin C skincare products all refers to ascorbic acid. So I used this in my recipe because I don’t have a lab and a team of researchers to determine whether Vitamin C from berries & other foods has the exact same effect. However, we encourage everyone to use only the ingredients they’re comfortable with! HI, Is citric acid and ascorbic acid the same thing? I have the citric acid from your dishwasher recipe, is it the same thing to use in this recipe? Good question Lochi. No, citric acid and ascorbic acid are not the same thing. You should not use citric acid in this recipe. Sure you can, Ginger! You could use pure aloe vera gel, water, witch hazel, vegetable glycerin, etc. I just love the hydrosols (especially rose) because they are great skin toners themselves. Have fun with this recipe! 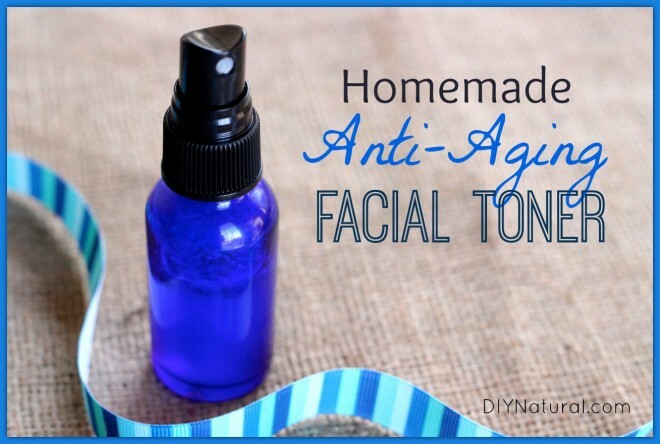 Thank you for this facial toner recipe. Can Walgreen’s brand of absorbic acid be used here? I have 2 giant full bottles of it because I learned that absorbic acid is only one component of vitamin C and is detrimental for ingesting. Thank you. what kind of spice grinder do you use? Hi Patti, we use and love this spice grinder! Hi! I have a stick of vitamin C but I do not have any of the ingredients you mentioned nor any essential oils or anything of the like. How would I use it alone then? Can it melted down and applied alone? Can I mix it in with my current moisturizer? I use Covergirl BB cream. Thanks! Hi Heather, we have no idea, you’ll need to pick up the ingredients if you want to make this recipe, but if you figure it out be sure to let us know. Blessings! Hi Matt! I will let you know if I come up with something or end up using your recipe. Maybe you could even do a post about using a stick of vitamin C in a recipe 🙂 Thanks for replying! I do appreciate it! Blessings! I find the oil soluble forms of Vit C to be far more stable. I also wouldn’t use any form of soy. You can sub out the soy Vit E for meadowfoam oil, which is very high in Vit E. Use a bit of sunflower lecithin to emulsify rose hydrosol with the oils and you’re good to go! This soy-derived vitamin E is non-GMO so there’s no concern.